Pairing: Deep, rich Syrah from Washington state's Columbia Valley: 2007 Waters Columbia Valley or 2009 Barnard Griffin. Pairing: Citrusy Riesling from California's Mendocino region: 2009 Breggo. Pairing: Floral IPA: Ithaca Flower Power. Pairing: Minerally Verdejo: 2009 Shaya or 2009 Sanz Villa Narcisa. 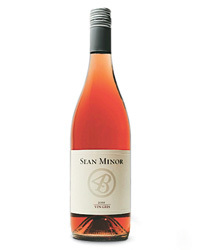 Pairing: Provençal rosé: 2010 Chateau Miraval Pink Floyd or 2010 Aix, from Domaine Saint Aix. Pairing: Citrusy, full-bodied Chenin Blanc: 2009 Pascal Janvier Jasnières. Pairing: Full-bodied Chardonnay: 2008 Landmark Damaris Reserve bottling or the lemony 2009 Luli. Pairing: Minerally Portugese white: 2010 Louis Pato Maria Gomes or Vinhas Velhas. Pairing: Montepulciano d'Abruzzo: 2009 Il Conte or 2009 Quattro Mani. Pairing: Tempranillo from Spain's Rioja region: 2008 Baron de Ona Finca San Martín Crianza or 2007 Pinturas Crianza. Pairing: Citrusy, spritzy Spanish white: 2010 Ameztoi Txakolina. Pairing: Minerally, light rosé: 2010 Lorenza or 2010 Bieler Père et Fils Sabine. Pairing: Robust rosé from Spain: 2010 Bodegas Olivares.